At the section Analysis at the top part of the Main window there is the button SEARCH GAMES. It allows to work with more filters for the Offer window at once. In this window, it is possible to define on each line what filter for the Offer window should be used. The ALL button at the bottom left then gradually starts all the defined filters, and after all the filters are finished, the results are available for each row. On each line, you can define a list of competitions (as defined in the Offer window) next to the filter name that you want the filter to use. It is also possible to set whether the filter should only be used for matches that have odds available (option 1-0-2). 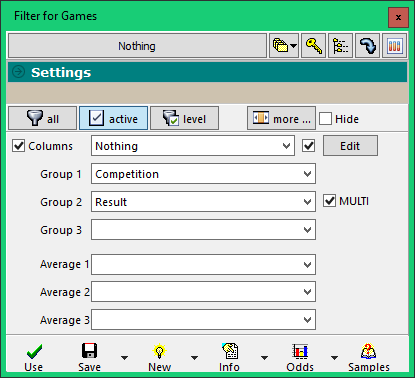 It is possible to select the bookmaker for which the filter should be run (in the next figure, this option is hidden by using the top leftmost switch in the filter list). We can also set the bet type for which the filter should run. And whether the filter should be applied to a different type of bet on the final match result (corresponding to the "Filter for the final result" option in the Offer window). 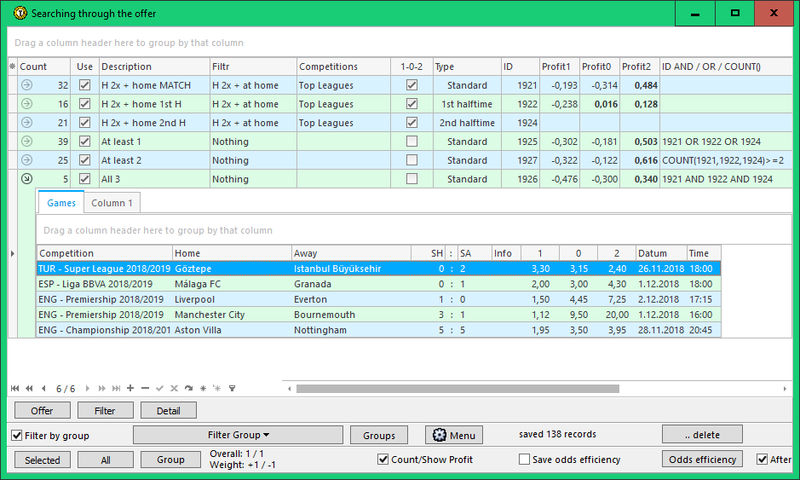 In the "Search through the Offer" window, the total profit for individual tips can be counted for matches played for each filter. Each created line automatically receives its unique ID tag. This ID can be used in other rows in the ID AND / OR / COUNT () column. This can affect the set of matches to be searched for: the set is defined by the results of using the filter on the referenced rows. For example, writing "1 AND 2" will cause the filter to apply only to matches found on ID 1 and ID 2 lines. If "1 OR 2" is entered, the filter will be applied to matches that were found on the line with ID 1 OR on the line with ID 2. The COUNT (1, 2, 3)> = 2 "entry means that only matches found on at least two rows of rows with ID 1, 2 and 3. .. the Columns section contains the definition "Nothing". This does not include any new columns; in addition to the default status, only the COMPETITION column is active. To the right of "Nothing" is an active field to enable data aggregation. In the Groups 1 and Group 2 fields, the COMPETITION and RESULT columns are selected. At the same time, MULTI is active. As a result, using this filter, the result in the "Search through the Offer" window will be divided according to the results of the matches in the individual competitions (see below). In the "Search through the Offer" window, we can apply the first created filter to different types of bets. For example, the final result, the first half result and the second half result in football. In each of these cases, matches will be returned when the home team won the previous two home games: overall, in the first half, in the second half (the type of bet defined in the TYPE column). To test the ID AND / OR / COUNT () column, we create another 3 rows with the second filter (that is, a non-conditional filter, even if it could have it) at least one of the cases (final result / 1st half / 2nd half), 2) at least two cases, 3) all 3 cases. .. matches are searched for a period that is active in the Offer window. Before starting the rows in the "Search through Offer" window, it is a good idea to have the Offer window open and set the period we want to analyze. To the left, each line shows how many matches have been found. Click the arrow on the left to see matches found in accelerated mode. 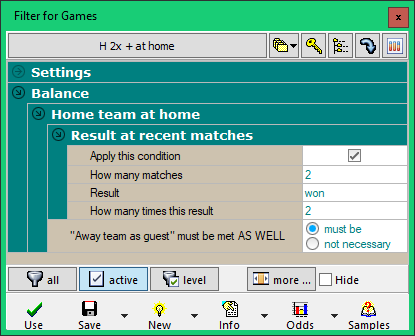 Complete display of matches found, including all returned columns, can be done by pressing the OFFER button at the bottom of the window. 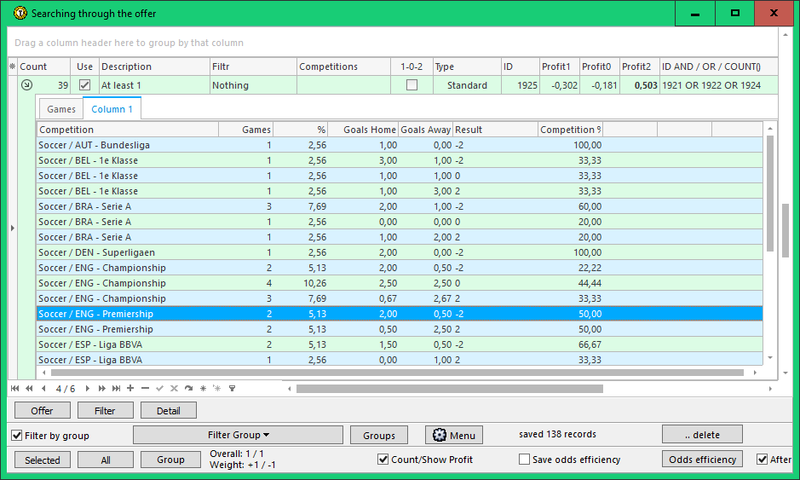 The accelerated mode only contains a list of matches, odds, profit (if the appropriate option is active at the bottom of the window) and possibly grouping data and averages if defined in the filter definition. In the next picture, details are shown on the line where the matches that meet at least one of the first 3 rows (ie home win in the last two home games either overall or in the 1st half or 2nd half). The next image contains the active section COLUMN 1 for the same line, where the matches are grouped according to the definition in the filter according to the results in the competitions. The -2 value in the Result column indicates the home win, the value 0 marks the draw and the value 2 indicates the win (-1 would be an overtime win and 1 an overtime loss). It shows the number of matches with a given result in the competition, the frequency of these records for all matches found, the frequency of all the entries in the given competition and the average of the goals scored.